Wow! the snow had all disappeared til early this morning and then it started coming down again and was strikingly familiar the big snow a couple of weeks ago. I am working on a representational piece from a photo of my Mom and her neighbor moving cows to summer pasture. It is an interesting shot as the cows are meandering and eating their way up this hill thru this high posted gate that was a signature of her neighbors fence lines. My mom is sort of in the midst of these cows and calves, gently urging them to greener pastures for the summer. I will put it up on the blog when I am finished with it. 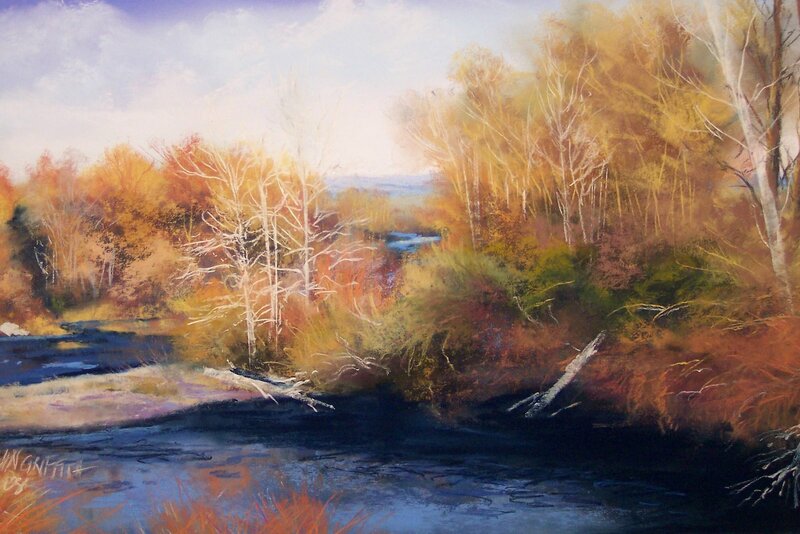 One of the pieces I just finished was of the Walla Walla River near Saviah Cellars. The river has a nice flow to it at the bridge on Pepper Bridge Road, and when I was at the winery for barrel tasting this year, I stopped and shot a few images of the river then. So I finished one based on a shot taken at that time. Then after the snow came and once it was safe enough to travel, I went back to this spot and shot some more images. There is some great potential with a couple of these newer shots with the hint of snow and a late afternoon glow to the brush and trees.